A full house of 160+ people were at the public meeting on Tuesday 23rd October, to talk to NHS Planners about the new ‘refreshed’ SOC (Strategic Outline Case) proposals about to be put forward by hospital bosses for public scrutiny in West Herts. Nick Kennell from West Herts Hospitals Trust twice reiterated that a brand new greenfield site hospital was still on the long list of proposed options, and after the meeting Kathryn Magson, Chief Executive of the CCG, insisted that it was possible to look at the feasibility of building a completely new hospital, even in the short time scale of three to four months. The planning options being considered will include a possible brand-new planned care hospital on a site between Hemel Hempstead and St Albans, but with a reduced capital budget. 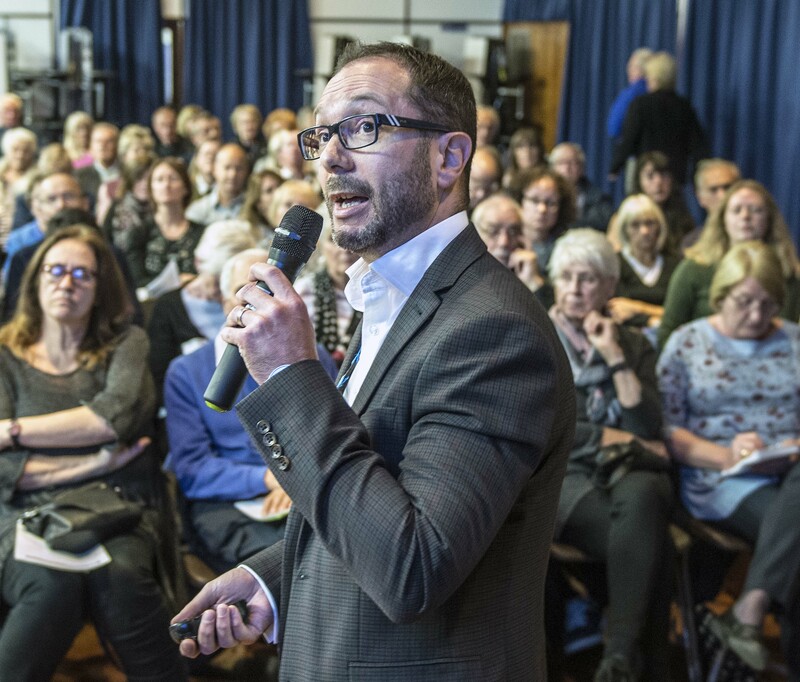 He and David Evans, from the West Herts Clinical Commissioning Group, both underlined the need to get more care out of hospitals and into the community. This was challenged by a member of the audience, who pointed to the overstretched and under staffed GP surgeries across the area. ‘It’s a trade off between what’s feasible and possible,’ said Mr Kennell. 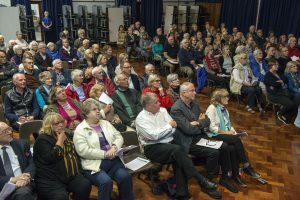 The meeting was told that a decision about the plans will be made by early 2019, and that the public will be kept informed. So far, Nick Kennell said in reply to a question, no decision has been made about the future of Hemel Hempstead and St Albans hospitals. The travel flow surveys carried out for the plan were challenged as out-of-date and only including morning traffic analysis. 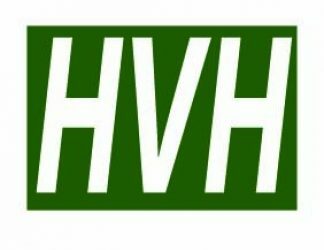 When asked about the land values of the three hospital sites, David Evans claimed they were lower than might be expected: £15 million for Hemel Hempstead and £20 million for St Albans. The value of the Watford site had not been assessed. 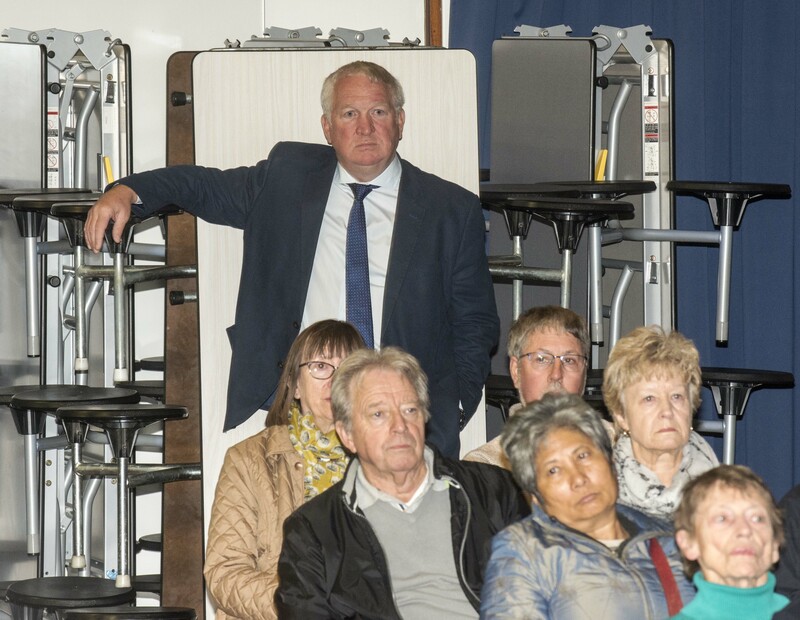 ‘We’ve been promised jam tomorrow before’, was the dramatic statement from Sir Mike Penning, MP for Hemel Hempstead. He stressed that Dacorum is the biggest area in West Herts, and has the largest population. David Kerrigan, an independent researcher, presented statistics showing that residents in Dacorum and St Albans travel further to A and E than patients in 43 of the 46 districts in the Home Counties. ‘Dacorum and St Albans are the Cinderellas of the home counties,’ he said, emphasising the ‘gross inequities’ between the north and south of the West Herts area. The need for hospital provision based on forward-looking data was underlined by Cllr Ron Tindall, who referenced the new garden town developments to the north and east of Hemel Hempstead, with a possible 20,000 more residents moving into the area. 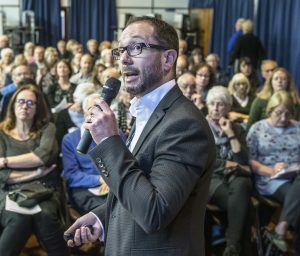 The meeting was told from the floor that in land area Dacorum is ten times the area of Watford, and St Albans is seven times the area, so inevitably future population expansion will be centred on these areas, not Watford, increasing the need for good hospital provision relative to population.